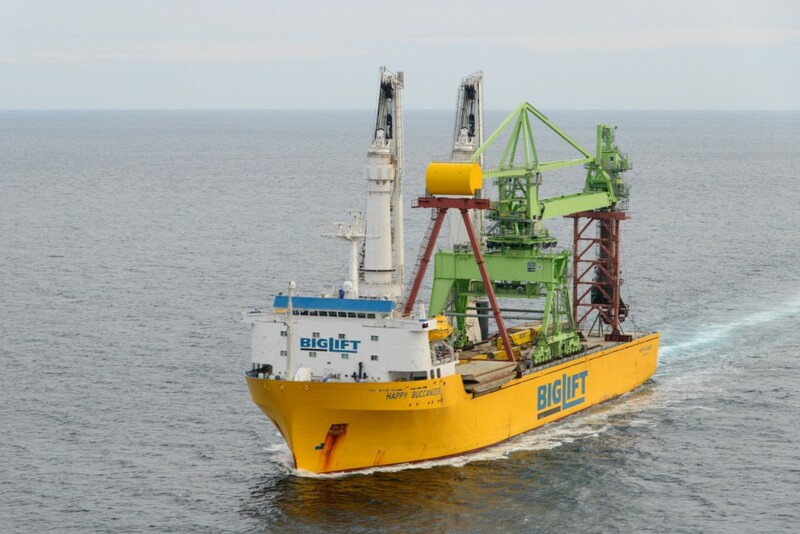 BigLift Shipping’s Happy Buccaneer successfully transported a 1,200 mt, 45 m high Continuous Ship Unloader (CSU) from Kaohsiung, Taiwan, to Haramachi, Japan, and installed it at the Haramachi thermal electric power station. The CSU is a replacement for the thermal electric power station that had been severely damaged in the devastating Tsunami in March 2011. The project was executed in close co-operation with the engineering department of our Japanese client IHI Transport Machinery Co., Ltd. The CSU was loaded and discharged by Happy Buccaneer’s two 700 mt Heavy Lift Mast cranes (1,400 mt in tandem), using two 24 meter BigLift lifting beams in the lifting arrangement. Particular challenges in this project were the high deckloads, the lifting height and required outreach of ship’s cranes necessary for the installation of the CSU. Due to the construction of the CSU, very large forces were expected on the supports of the bucket wheel boom and the Ballast arm. Therefore, a detailed load spreading plan was made to lead the forces into Happy Buccaneer’s high-strength upper deck. During the voyage, the acceleration forces on the CSU were constantly monitored, using the OCTOPUS-On-board system, a state-of-the-art system that delivers real time vessel monitoring and supports the vessel’s route planning, speed optimisation, heading and fuel consumption. Furthermore, as always, all seafastenings were checked daily and were adjusted if and when required, thus further contributing to the safe and clean delivery of the cargo. The vessel sailed from Kaohsiung on January 12th and arrived at Haramachi on January 17th, where the vessel was challenged by a closed port due to bad weather so that ship and CSU had to ride out the storm at sea. Eventually, Happy Buccaneer berthed January 20th and had the CSU successfully installed by January 22nd. During the installation of the CSU at the thermal electric power station, the CSU had to pass over the conveyor belt system on the berth. This operation required a lifting height of 40 m above the wharf and a crane outreach of 14.15 m from ship’s side! Not a problem for Happy Buccaneer with her 32 years of experience; she performed excellently in the project for Haramachi port.